Rudd as ‘straight’, Julia as ‘fixer’….and Tony? Politicians can be divided into ‘straights’, ‘fixers’ and ‘maddies’. This ‘simple but dazzling insight ’ from the British politician Tony Benn is one of those lightning bolts that light up a vast landscape. And even explain a few things. Consider the application of this flash of explanation to a strange moment in Australian politics. 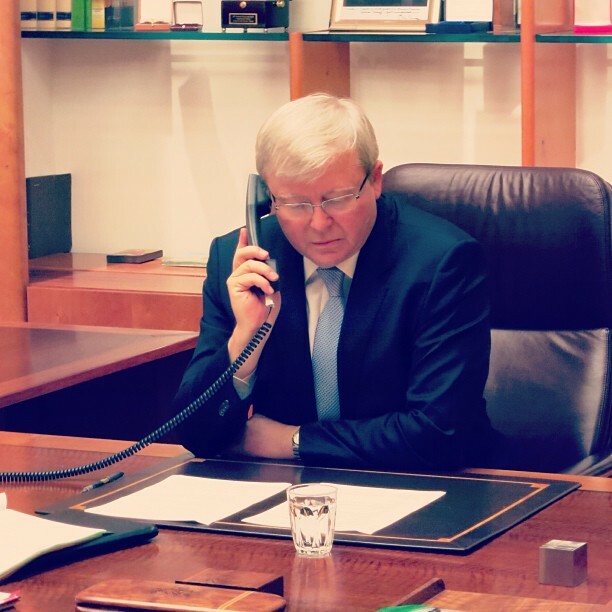 Kevin Rudd is a straight. Julia Gillard is a fixer. And Tony Abbott? Before applying the labels, turn to the definition and description of the categories. The central truth of such attempts at understanding leaders is that the focus is on personality as much as policy. This is an act of division and designation that many have tried. Isaiah Berlin famously offered a binary division based on a fragment attributed to a Greek poet : ‘the fox knows many things, but the hedgehog knows one big thing’. Berlin sorted writers and thinkers into the two categories in what became one of his most popular essays. Those he identified as hedgehogs, with a single defining idea, included Dante, Hegel, Dostoevsky, Nietzsche, Ibsen, and Proust. Those who ran with the foxes included Shakespeare, Montaigne, Goethe, Balzac, and Joyce. Berlin later commented on the impact of the hedgehog–fox categorisation: ‘I never meant it very seriously. I meant it as a kind of enjoyable intellectual game, but it was taken seriously. Every classification throws light on something’. Applied to politics, Berlin’s approach did offer some light but ultimately not much illumination. As an illustration, I once said to Singapore’s then Prime Minister, Goh Chok Tong, that even after years of observation I still could not decide whether Paul Keating should be seen as a hedgehog or fox. Goh wasn’t too sure either, although he did comment that you’d never want to let Keating loose in the chicken coop. One observation about Berlin’s work as an historian of ideas  is that he ‘typically focused less on the logic of a thinker’s arguments than on the subject’s personality and social and intellectual background’. Bingo! The aim is to get inside someone’s head and try to see how that personality drives their actions. For this, maddy, fixer or straight is far more useful than hedgehog versus fox. The man who has done the most in Australia to popularise the Tony Benn definitions is that great public intellectual and philosopher of the press and radio over five decades, Phillip Adams. Here’s one of his columns  arguing that the maddies make history, even if it is the straights and the fixers who keep the wheels turning over. My description of Keating as a maddy provoked a quick call from the Lodge. But it wasn’t abusive. Anything but. Paul was almost purring. He knew that although some maddies can be as destructive as anything the Richter scale can offer, others have a genius for building. The true movers and shakers, maddies make history. The Keating code? You’re not in power for long, so there’s no time to waste. Do whatever you can while you can. The definitions are useful because they’re all about the interaction of personality with power, and have almost nothing to say about formal political labels. Even family ties can’t dislodge the judgement imposed by the three categories. George H. W. Bush was a classic and successful straight, whereas his son George W. Bush was the worst sort of fixer—he actually broke things. Satan was once angelic; he and God had much in common. Similarly, both the Fuhrer and his English nemesis were born demagogues. Each believed in the supremacy of his race and in national destiny; each had artistic talent – Churchill had more, but Hitler, though dismissed as a shallow painter of picture postcards, was a charismatic figure moved by dark but profound passions…The inescapable fact is that Hitler and Churchill were ruled not by reason but by intuition. Seeing those maddy similarities puts into even sharper relief the differences between the two leaders. Churchill’s command of the language extended to humour, while Hitler was never recorded as uttering a joke. The greatest British Prime Minister was often droll with a distinct purpose, as on the day that the told Parliament that the nation was ‘strangled by old school ties’ and compared the private school system to ‘feeding sham pearls to real swine’! Churchill understood the need to put some limits on his maddy dynamism. The man who kicked along public servants by devising red labels for key documents with the stark instruction ‘ACTION THIS DAY’, also stressed to his staff that his orders were to be obeyed only if he put them in writing, immediately or immediately thereafter. The world is lucky that Hitler, lacking similar self awareness, was a mad genius as prone to mad moves as to genius. If the typology of maddies, straights and fixers is too flashy for you, help is at hand. The US writer Joseph Nye has come up with a more academic or formal version  that covers much the same ground. His category of ‘transformative’ leaders seems to match that of the maddies. Opposed to the transformative types are the leaders that Nye prefers (Eisenhower and Bush the senior) who are defined as ‘incremental’. Leaders’ objectives can range on a scale from status quo through incremental to major change. I will call those who seek major change transformational leaders and those at the other end of the scale incremental leaders. We can distinguish leaders’ styles by how they use hard and soft power resources. I will use the term transactional style to characterise the skills with which leaders manage their hard power resources for coercion and payment, and inspirational style to characterise leadership that rests more on soft power skills of attraction and persuasion. Thus the opposite of a transactional style is inspirational, not transformational. Well, I’m glad we’ve got that clear. Joseph Nye is a great thinker, always worth reading, but sometimes the transactional benefits of his insights arrive incrementally. Let’s turn instead to the vivid pyrotechnics of maddies, fixers and straights; the next column will see where Rudd, Gillard and Abbott fit in this vision of leadership types. Graeme Dobell is the ASPI journalist fellow. Image credit: Instagram user kruddmp .